Today’s guest, Phil Kim, is a highschool dropout turned accidental accountant turned tenured educator and professional speaker. He shares the remarkable story about how he fell into a hole and then turned his life around by chasing BIG goals through small actions. In December 2016, Phil gave a talk at TEDxAlbany called “Chase One Rabbit: The Power of Small Wins” (related to his book of the same name). The book and TED Talk both explain how we can use focus, accountability, and small wins to achieve more. Reach high. Expand and stretch yourself beyond what you think you can do. Choose a single, big priority. Chase the rabbit. Take your singular goal and break it down into smaller, doable chunks or small action steps. Intentional Accountability. You have your goal and you have your action steps. Now you need some sort of accountability, either with just one or two people or through a small community (like a mastermind). There’s a theory called the the paradox of choice. It suggests giving users too many choices causes them to worry about making the wrong decision, so they don’t make any decision at all. Too many choices can effectively lead to no choice. So don’t try to do everything at once. Finish your top priority and then move onto your second priority. We’re almost done with the first quarter of 2017 (wow that was fast!). I want you to watch Phil’s TED Talk or read his book and then reflect on your goals for the year. Do you have too many? Are they ambitious enough? Prioritize your goals and get hyper focused on just one rabbit – you might surprise yourself with how much you accomplish. You can watch Phil’s first TED Talk on YouTube or pick up his books on Amazon. 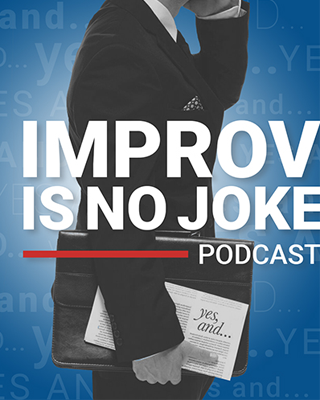 Peter: Welcome to episode 40 of Improv is no Joke podcast. Thank you so very much for downloading this episode. Today’s guest is Phil Kim, who is an associate professor of business at Wallace University in Canton, Ohio and the Founder of Ideapath Consulting, which is a management consulting firm for entrepreneurs and small business owners. Our discussion centers around the powerful TEDx talk he gave an Albany, New York in December 2016. His talk is titled “Chase One Rabbit: The Power of Small Wins.” I’ll put a link to his TED talk in the show notes for you. Phil based his TED talk on a Confucian saying: “person who chases two rabbits catches neither.” In today’s world we are chasing so many things that we want to get done, and if we don’t have focus nothing gets accomplished. The need to focus on those critical things and setting them at the highest priority. Phil says that if you hit all your goals for last year maybe your goals weren’t challenging enough. What he tells his clients and students is to stretch yourself: set high goals and then break them down into little chunks, action steps, and be accountable to someone or a group. Phil tells a great story about an app named bourbon, which got my attention, that was developed back in 2010. Now bourbon was a social app designed by Kevin Systrom and his buddies, who named the app after their favorite adult beverage. Now this app was a party app and also would allow you to give restaurant reviews and ratings. By doing this you would earn badges, and if you accumulate enough badges you would get discounts to those places. Now that really never took off because what users were doing with it was taking pictures of cats and what they were eating at restaurants. Ultimately they took the app down and redesigned it and launched it under a new name. You may have heard of this name: Instagram. What Kevin discovered was that they were giving users too many choices and decided to reduce the number of options to picture taking, and the rest is history. Phil refers to this as the paradox of choice. This is when you give people too many choices and they’re afraid of making the wrong decision, which leads to no choices. Well that might explain why it’s been forever since I’ve been to a Cheesecake Factory. 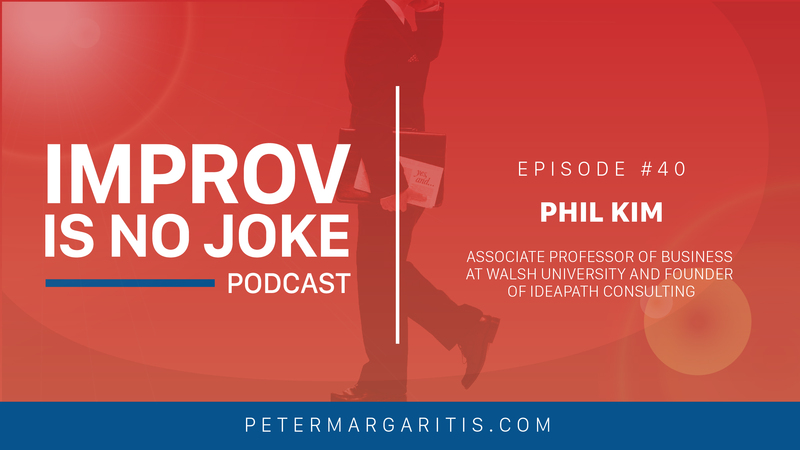 Phil has a lot of great stories in this episode and one of my favorites is how he became a college professor. I’ll leave it at that and let you listen to his story. Clearly, from an improvisational aspect, focus, being present in the moment, is critical in accomplishing your goals, along with the yes and, attitude to help you make those small wins for the bigger accomplishment. Now if you have been listening to my podcast for a while, you know one of my goals with his podcast is to help you begin to make changes in your work and personal lives so you can better connect with others and create meaningful relationships. Many people have said it takes 21 days to start a habit, which I just learned this week from Dr. John B Molitor, PhD, that’s incorrect. John is the Dean of psychiatry and community at Michigan State University. He said that the research shows that it takes 66 days to create a habit. So now we gotta put in some extra work to create that muscle memory. That’s why I created the Yes, And challenge: to help keep these principles in front of you so you can build up your improvisational muscle. To sign up, please go to PeterMargaritis.com and scroll down to the Yes, And challenge call to action and click to register to begin building the productive habit of Yes, And and the principles of improvisation. And remember to show your experiences on twitter using the hashtag #yesandchallenge. If you’re unsure of what the Yes, And challenge is all about, I discuss this in detail in episode 0. Go back and take a listen. Remember you can subscribe to my podcast on itunes, stitcher, and google play. 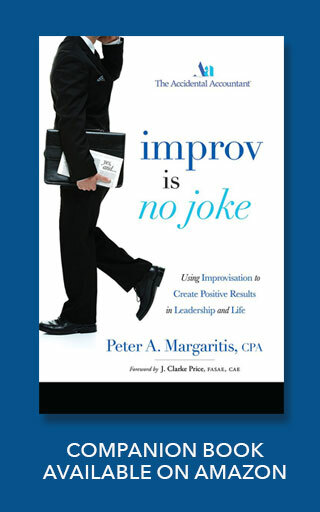 If you’d like to purchase an autographed copy of my book Improv is no Joke: Using Improvisation to Create Positive Results in Leadership and Life, please go to my website, PeterMargaritis, and you’ll see the graphic on the homepage to purchase my book. With that said, let’s get to the interview with Phil Kim. Peter: I’m with Phil Kim. Phil, who is a recovering auditor, banker, and currently in higher education. But first and foremost, Phil, thank you for taking time to be a guest on my podcast. Phil Kim: Pete, I was looking forward to this. This is awesome. Thank you for having me. Peter: Oh Phil, I’m so looking forward this conversation because I want my audience to know, first and foremost, that you recently did a TED talk at a TedX in Albany, and your talk was called Chase One Rabbit: The Power of Small Wins. As I listened to the your TED talk, which is absolutely fabulous, I was thinking about that thing about chasing one rabbit, and when I think of that in my business I think about rabbits and how they multiply. Peter: and unfortunately I don’t think I’m chasing one, I think I’m chasing a herd of them. So when I was listening to you talk, I went “man I have to really narrow that down to just one rabbit.” So you know, I usually ask about my guests to give me a little bit about their background. But I think our conversation about this Ted talk, and about your message here, will enlighten everybody to your background. So tell us about this chasing only one rabbit. Phil: [laughs] Yeah, that’s good. I’m glad you brought that up, in that way. Yeah, I was able to do a TED talk in December in Albany, as you said the title of the talk was Chase One Rabbit. It’s really based off of a Confucian saying that if you chase both rabbits, you catch neither. So that is what germinated this idea, which led to a book, which obviously led to the this TED talk. But the idea is really about this power of focus, and specifically focusing on small doable action steps. And what I like to say is a series of small wins leads to great results, and I mean we can delve into that little bit more but I think what you said was was perfect. I think so many of us, especially entrepreneurs and leaders and business owners, we feel like we’re chasing so many things. There’s so many things that we want to get done, and it’s especially either year end or beginning of the year, whenever your audience is listening to this, I think there can be almost a laundry list of things that you want to get done, which is fine. I think we should have multiple goals. However, if we’re spread so far thin we’re not going to do anything really well, and I guess that’s my main point. In order to achieve a certain level of either expertise or success or to accomplish something… if it’s worth doing it’s worth doing well, and the way to do that is to really let go of all the peripheral things and let go of all the things that, in my opinion, really don’t contribute to your end goal, and then really focus on the things that will contribute to where you want to go. Peter: Well, you said the magic word there. There magic word, in the world of improv, is focus, and being completely focused on that, and somebody who’s got ADHD as myself (which is really difficult at times – squirrel!). And as you’re laying this out and I was listening to it I’ve got a whiteboard and I’m looking at my things that I want to get accomplished in ‘17, and I’ve got seven items on there. Now, prior to listening to your TED talk, there were no numbers besides them in priority. Instead of me going [as Elmer Fudd] “be vewy vewy quiet, I’m happy wabbits” and now I’m just hunting one wabbit at a time, which really helped me to try to get that into some type of focus. I’m terrible at that at times. I can work on four or five projects at one time, and a lot of times I never get them done. I get about 50 percent, 70 percent, 80 percent through them, but sometimes I never get a hundred percent. I think to your point, I’m chasing too many rabbits. Phil: Yeah, that is excellent. In fact, I talked about this in the TED talk, but it really takes this… I call it intentional accountability. So first of all, I was just going to say what’s your priority? If you were to look at the list of seven things, what will be THE most important thing that you would want to get done? And then what’s the next most important, so on and so forth. So obviously I would say, if you if you hit all your goals, if you think about 2016, if you hit all your goals in 2016…. first of all, kudos to you, but most people don’t. And I would argue, if you’re a person that hit all your goals from last year… then your goals may not have been big enough. It’s one of those things where it’s like… you know those people that have those checkoff lists and then they cross them off? There’s some sort of satisfaction in crossing something off, but there are certain people that will already have done the thing. I don’t want to fall into that almost fake satisfaction of getting something just to cross it off of your list, so what I say to my clients and to the students that I’m advising is I want you to reach high. I want you to expand and stretch yourself beyond what you think you can do and then, to chase that rabbit, I want you to chunk it. I want you to break it down into smaller, doable chunks. And then this accountability piece is where it really sort of ramps it up to the next level. So you have your goal, you have your action steps (where you’ve broken it down into what I call small wins), and then you have some sort of accountability either with with one or two people or just like our mastermind. I don’t know if our audience knows, or maybe you’ve discussed this on another podcast, but Pete and I were part of a, in my mind, very successful mastermind with professional speakers. Every week we had to update each other on where we were with our progress. So again, you probably could have given the TED Talks. Many people have all these different projects in different stages of completion, and my argument is: okay, well that may work for a short period of time, but at a certain point you have to finish something. You have to take it through, you gotta take it across the goal line, or else you’re gonna feel like your year was not as successful as it could have been. A way to do that is to have this hyper focus on getting something done, even if it’s poorly done… at least it’s done. So then you can either move on to the next thing, or now you can look at ways that you can improve. Peter: Exactly, and I want to come back here in a moment or two and talk about your professorship and your students. He is a professor at Walsh, which is in North Canton. But I want to take a step back and want to go back to your TED talk and how you started your TED talk about the app. That was a great story. Phil: After his favorite drink, nonetheless. It had nothing to do with the app, but he liked the drink, so… but it’s a party app, a get together with your friends app, but after a few months it basically went nowhere. There were only a couple hundred active users of the app, and he had raised over half-a-million dollars to take this app to market. Even at that point, 2010, was a lot of money for for an unproven app. So he was going back to his investors: “what should I do? Should I shut down the app?” But before they decided to effectively shut down the app, they took a closer look at what their users were actually using it for. I say this in the TED talk, but they were effectively using the app to do two things: take pictures of their cats and take pictures of their food. Phil: So if you think about it, in 2010, this was way before the selfie revolution. And I see, seven years later, we as a society have not moved much beyond this. So they went back to the drawing board they took the app off the market, actually, which is sort of like the death knell for apps. If you take it off, that basically means that you’ve given up on it. But they stripped away all the other ancillary things. You could check in, get badges, get stickers… but they focused in on the pictures, and then specifically that you could add filters on your pictures, and then of course they renamed the app Instagram. Phil: Yeah, exactly. The day one relaunch of Instagram they got twenty-five thousand downloads. Phil: They thought man, we’re onto something. A year later, they were over a million downloads, four million or 40 million pictures, then of course facebook came calling. They got bought out for a billion dollars, I think was 1.2 billion dollars in cash and stock, and at that point it was just unbelievable to go from almost bankrupt with a few hundred users, because they had all these cool bells and whistles, but then when they stripped it all away and they allow their users to focus in on one thing, that’s when it just took off. Phil: The other thing that’s crazy is… 1 billion dollars for something that just takes pictures? Well, analysts have valued Instagram it over 37 billion dollars now. So Mark Zuckerberg obviously made a good investment choice, and it’s caused more users to download his his app. So, no matter what people say, Facebook and Instagram, at this point, are still the 600-pound gorillas in the room, and I don’t see it going down anytime soon. Phil: Yeah, exactly. So there’s a theory called the the paradox of choice: when you give users too many choices they worry about making the wrong decision, so they don’t make one at all. So too many choices effectively leads to no choice. That’s what happened with instagram. Peter: But if you’ve got a goal in mind. Peter: and you talk this in your TEDTalk, and you bring really your own personal experience in it, that you take these small steps, this series of small wins, that leads to great results. So if you could tell my audience about your background, about these small wins that you took in order to get this great result. Phil: Yeah, well, so again this is the straight from the book and also the TED talk, but actually I have somewhat of a storied background. You introduced me as an auditor and a banker, which I was, but actually up until about tenth grade I was pretty much the model student. I grew up in a traditional Korean house, and if you know anything about… actually, I was gonna say Koreans and asians, but it’s this probably true of many American immigrants that move over. Their parents hold a value and esteem for education above all else, and corporal punishment. Phil: Yeah, I grew up in a house where education was number one and, if it wasn’t, then I was… “highly encouraged” to pursue education. So up until 10th grade I was pretty much model student, got straight A’s or the occasional b or b+, but it wasn’t really do to any sort of hard work or diligence on my own. I basically just showed up and I was able to get those grades, but in my junior year I ran into a buzzsaw, and I call her the buzzsaw, and her name is Ms. Ryan. So, Ms. Ryan was a was my AP physics teacher, and I went to her class and I failed my first exam. Phil: I thought what in the world just happened? Honestly, up until that point, I’d never failed an exam. She said, “Phil, you are smart but you’re lazy,” and it was just one of those hammer between the eyes sort of moments. Nobody ever told me that, nobody ever accused me of it. I thought don’t you know the agreement that we have here: I show up and you give me an A. So she said no I want you to show up, I want to do you know turn in your homework on time, I want you to pay attention in class. I thought okay. I’m going to give her game one more shot. So I go back the next day and it was a pop quiz, and obviously a pop quiz, it’s unannounced, I failed that one too. And it was at that point I bailed, and I first started just by skipping her class, Pete, but then it became so much easier to skip my other classes as well because I really wasn’t getting anything out of it. And then a few classes became a few weeks became over 75 days of school missed for that year, from January through about May. So it’s almost like every day, monday through friday, I would come and check in with my homeroom (because that’s how they checked attendance) but then the rest of the day I was… I don’t know if any of your listeners are Millennials, but I used to go to a thing called a mall where they would have stores, and I used to I used to play at thing called an arcade. I know don’t exist anymore. Phil: Where you have to put quarters into a machine, and I would just waste my day away just playing arcade games. That was it. It wasn’t like I was doing anything fun or cool. I was hanging out with old people at the mall playing arcade games. Like I said, I missed over 75 days of school and ended up having to drop out of high school because I couldn’t pass that class. It was a small high school and she was the only teacher teaching that class. There was no way around it. And, at that point, while my friends were going up on stage to get their diplomas and kind of doing their thing, it was the summer of 1995. I was just a mass of self-pity and my dad had basically said “you have two choices: you can either find a way to to finish out your education and and go to college, because that’s what we came to this country for, or you can join the military. Those are your two choices.” And I found out real quick that all college applications said the same thing: high school diploma or equivalency, so like I need to find out what that means. So this was, again, pre-google. So I looked up in the yellow pages. Phil: Yeah, I looked up in the yellow pages and found a testing center. I went to a testing center. It was me and a bunch of adult learners. It was military folks, single moms. It was a very humbling experience for me. So I went from almost the height of arrogance, you know I don’t have to do anything to get an a in high school, to really just almost forcing my way to get this GED, general equivalency degree, and like I said already got my SAT scores. Thankfully, I had gotten that before this whole thing went down, and I filled out an application. Even in my application I explain how I made these mistakes but I was looking to turn my life around, that kind of thing. So it did provide some story, but it was one small step after another. So get the GED, make sure that the standardized testing scores were still valid, I had to apply to schools, had to write applications…. so it took some work but I chunked it down to small steps. And if you were to look at me, especially at the end of my junior and senior year, you would think this kid’s go nowhere. I mean he’s just to screw up. All he does is hang out at the mall and he’s gained a lot of weight, and it was just a period of my life where nothing I did was right. I could do no right. But I sort of glommed onto this idea of just small wins after small wins, and it was really my dad that sort of forced me into looking at life that way. So eventually I got into one college – only one college accepted me, and it was a struggle even then. I didn’t get great grades but I knew I sort of had to at least pass one class. So you kind of build up to it and then, eventually, I got my first job. Like I said, a CPA consulting. This is kind of funny. I got a job, and this is right around y2k, so really everybody was hiring. It was y2k of sarbanes-oxley. Phil: So for those of your audience who aren’t either in the financial world or CPA world, this was like one of the biggest governmental regulations that caused a hiring spree. So, in the year 2000, basically this company was looking for somebody with a college degree and a pulse. So I had both… barely. Phil: He said you were up against three other candidates and none of them wore a belt, and at that point I realized… it was just such an arbitrary moment and I don’t even know why I was like I have to wear a belt, but it really kind of brought me down to earth, so to speak. It just humbled me and I thought some of the things in life that happened to us are as arbitrary as that. Phil: It’s not due to any great talent that you have. You might get the client because you wore a blue colored tie that day. I guess my point is that it was very humbling to me and, at that point, I thought I don’t think I want to be in this industry where such arbitrary decisions are made off of what you wear. And to this day I wear a belt. You know, even to bed I’ll wear a belt. Phil: That’s like my thing, so I don’t want to lose out on any clients. Peter: Are you wearing one right now? Peter: Okay, good good good. That’s a great story! Phil: But it’s basically western Pennsylvania. And I’m working for one of the client banks there. Great organization. One of the top 100 places to work. Loved what I was doing… but there was always sort of this gnawing feeling in the back of my throat that I wasn’t doing what I was meant to do. I’m sure you know what I mean, because you’re a recovering accountant yourself. Phil: But for me, it was this idea that I wanted to make an impact on people’s lives beyond just saving them money or keeping their account secure. But one my mentors said “Phil, if you want to teach full-time, first of all you got to get your doctorate, but then, secondly, you have to teach. Like you have to take any classes that you can.” So I was applying to all these colleges within a 50-mile radius, and all of them either turned me down or they had their gigs lined up already or they had people. Until, finally, it was at one of those networking sessions, but there was a buddy of mine who taught full-time at Frostburg State University. It’s a small College in Frostburg, Maryland. And if you can draw a line from indiana, PA to Frostburg, Maryland… first of all, you can’t. There’s no direct line to it. You are driving through mountains… and it took, one way Pete, it takes three hours to get there. And he said “I really need somebody to teach this wednesday night class. Can you do it? It start six o’clock.” Okay, so I checked with my boss and thankfully he was very flexible. He knew I was going back to grad school and he knew that the ultimate goal was to teach, so he allowed me to flex some hours. So on wednesdays I would come in at like five in the morning and I would work through until about three and I would hightail it. I mean I would just break land speed records to drive from Indiana, PA to Frostburg, Maryland. It took three hours. I would teach that nice night class from six to ten, and then I would drive home and I’d get home around 1am. And I did this for about six months, and even now to this day my wife and I just laugh about this. Can you believe that we we got through that? And it just goes to show that, really, you need a series of small wins… and sometimes the small wins don’t look really glamorous. Lo and behold, after I got that job, that’s when I got started getting calls from other schools saying “hey, we see you have some teaching experience, can you teach our class?” So eventually I got some teaching experience to some schools closer to Indiana, and then what made my resume that much stronger against other candidates. Whenever I went for my full-time teaching gig they had seen that I had about three years of teaching adjunct courses at various different schools. It was just another classic example of a small wins leading to remarkable results. Peter: First, I gotta back up. So for my audience, next time you’re going to an interview make sure you have a pulse and you’re wearing a belt. Phil: [laughs] That’s right. You’re halfway there if you have those two things. Peter: So you went from from a high school dropout to… your position at Walsh College now is? Phil: I’m an associate professor of business. Peter: That’s remarkable. Kudos to you for having that that drive to pick yourself up and and figure things out and make that move. That is one remarkable story. And how long have you been at Walsh now? Phil: I’ll be completing my seventh year by the time May (2017) comes around. So I’ve been here almost eight years. Crazy. Peter: I was at Ohio Dominican for six or so years. Are you tenured faculty? Phil: I am, yeah. In fact that was that was one of the goals, obviously, to obtain tenure. That’s kind of a neat story too. For those who are, in fact, higher higher ed or familiar with it, you know it can be this long, drawn-out process. In fact, my predecessor, the reason why I got hired here, was because they recently had gotten rid of three or four faculty. It was sort of as a clean slate within the business school. And my year, 2010, they had hired three or four faculty members, and the accountability group that I’m in, the mastermind group that I’m in here with faculty, three out of the five of us who were up for tenure last year all got it. So it was sort of… recognition or celebration of the hard work that we put in. So yeah, for here it’s a six-year process. After your sixth year they review your profile, your teaching evaluations, how much scholarship you’ve done, your service, and it’s it’s a really neat thing to be recognized by your peers, because it’s a vote by the by the committee but also there has to be a majority vote by your peers. So that was what was most meaningful to me. Peter: That’s awesome. Congratulations on tenure. Peter: I’m trying to remember how Dominican was, but I’ve been away from it for so long. But I remember that process. I don’t have a PhD but I was full time because of the equivalency of a master’s in a CPA. Phil: I think it was more than that, but go ahead. In fact, were you at the NSA convention in Philadelphia? Phil: I’m not here to embarrass you, but I think we actually met then, and the only reason why I remember it is because I was listening to either one of your podcasts or talks before and you were talking about being at the laugh lab. I thought, you know what, I think I actually remember that. it was sort of a serendipitous happened. We didn’t know each other but I think we had actually met then… so it’s actually been a couple years, but you’re right. Actually knowing each other professionally and as colleagues and friends, yeah, a little over a year. Peter: So we’ve know each other for a while, and one of the things I remember – maybe you were talking about this in our mastermind group – is about the garage. Could tell our audience about the garage? Phil: Oh my gosh. I love this. Thank you for asking. So this was, again, just a classic story – almost an entrepreneurial story, actually. So these four students on campus wanted a place to meet, to collaborate, and to create. And they really couldn’t find any place on campus. I mean, they could meet in the cafeteria but that was sort of loud and you can’t really do anything there. The library had limited hours, and nobody really wanted to meet in one person’s dorm room. So they’re scouring the campus, they’re asking around, nobody’s giving them any positive responses, but they somehow find this empty storage space, basically, on campus. I honestly have no idea how they found it, but it at one point it was a literal garage. So it’s not a part of the new buildings, it was sort of across the street, but it was all owned by the university. So they start asking questions, they meet with the faculty, they say hey have you heard of this? What are we using this space for? No clue. They end up meeting with the facilities Department. Hey, what are we doing here? They kept on asking questions, and if you think about it these are students that have no money, have no connections, no influence, really… they just have an idea. Phil: and eventually they met up with the the president of the university. His name’s Richard Jusseaume and he is an entrepreneur himself. He’s built up multi-million dollar companies, but he has a strong tie to to Walsh University in that he was actually… I don’t know what the correct term is, but his life plan was to be a brother Christian instruction but, eventually, he found his wife, wanted to get married and have kids. They took a different route, but they brought him back as the president. He’s been here for about 10 years, or 15 years. In terms of tenure for university president, that’s really long. They usually last about five to six years, on average. Phil: He was here, the students got an audience with him, and he got it right away. He green-lighted the project. They raised I want to say a $150,000 or something like that to renovate the space. It went from a junk storage space to really sort of decked out with state-of-the-art technology. We have a 3d printer in there. And, if you could see it, it’s really cool too. It actually looks like a really cool garage. Like it went from dirt floor to sort of this slab sort of concrete with whiteboard paint on the walls are, it’s Wi-Fi decked, and every technology that’s relevant to them. It’s perfect for them. It’s suited for them. And it’s run by students ,and it’s really designed by students. They’re the ones who booked the speakers, they book innovation challenges and hackathons, and in the past year we’ve had I want to say at least three to four student-run businesses that have actually been born out of there that garage. So it really went from nothing to, now, some sort of revenue-generating thing for the students, and obviously a great sort of success story for the university. The reason why I was brought in is because I’m the faculty advisor. I’m the one that makes sure that the place hasn’t burned down, make sure the kids have access when they need, but it’s open 24/7. That’s the other thing. They have access 24/7 because, as you know Pete, creativity and innovation doesn’t happen between the hours of 3 and 5 p.m.
Phil: I mean, you need this open, collaborative space with students from all majors. So you have management majors, a nursing student, somebody who’s in physical therapy and wants to design a new running shoe, there’s a museum studies person in there. I mean it’s it’s a really cool place where there’s a lot of energy and a lot of creativity and innovation happening. So that’s on the student side, and then we also have community mentors that will agree to come in once a month to give their opinion on something or give a short 10-minute talk, and then there’s almost a town hall meeting, back-and-forth Q&A type thing. So they’re sort of these formal either meetings or speakers or gatherings, and then outside of that it’s just sort of this free-flowing students come in and out and they work on whatever project they want to work on. They call it the garage, because they they did their research and companies like Apple and Microsoft and Disney and Mattel all started in garages. So their goal is to start the next bourbon or Instagram there, if you will, in that garage. I’m really excited about it. It’s one of things that I’m most excited about here at Walsh: just that students are super motivated. The other thing is they don’t get credit for this. This is on their own time, there’s no course associated with this, and that was by design. They didn’t want to get a grade for attendance or things like that. They just wanted it to be there space where they can meet with other like-minded students and community mentors and start building stuff, so it’s a really really cool thing that they have on here. Peter: That is way cool and kudos to the students for the initiative of starting it, and you just blew me away. They don’t want credit for it. They just want to place where they can collaborate and create and build, and please correct me if I’m wrong but I think in the TED talk when you’re kind of talking about this, is this where you use the term MVP? Phil: Yes, thank you. So one of the key tools or methodologies that they use is the MVP, and they get it from agile rapid prototyping or agile programming. This idea of this minimum viable product. So what’s your MVP? So these students will come in and have, essentially, if they’re not familiar with the garage process, they’ll come in and they have these great ideas. We wanna build something that can that can mow your lawn and that can cut your hair and that can do your laundry and file your taxes, too, and it’s all in a mobile app. Phil: and it’s going to change the world. And we kind of laugh, but every student comes in that way because it’s the Instagram story all over again. Okay, that’s great, but let’s boil it down to “what is the core essence of what you want to do or what business problem you want to solve or what pain you want to provide a solution for.” And we force the student entrepreneurs to kind of scale back to what is the core essence, what is your MVP? So that’s what I usually ask them to do, and it takes a little bit for them. We want a working prototype so you can actually see how it works in the field, in the wild so to speak, and then if we were to pair you up with a community mentor… they’re not gonna have expertise in culinary arts as well as haircutting as well as tattoos. I mean, maybe they might, but ultimately we want you to have a laser-like focus because that’s going to provide you with the best opportunity to have a working prototype to either take it to market to test in the wild, or to get investors. So that sort of changes the narrative from I have all these great ideas. No, let’s get to your MVP. What are your core things that you need to get done before you move onto the next thing? I’m not limiting you. What I believe I’m doing is I’m allow you to achieve the most success that you can by chunking it down into these sequential steps. So our brains don’t really work in sequential steps, I understand that, so I want to respect that process because that’s how creativity happens. But once we get down to actually producing a product or service or improving your business or getting more clients, it really does take this almost laser-like focus to get a thing done. To prioritize things and to get that thing done, and then move on to the next thing. You’re going to feel a lot better about yourself when you do it that way. Peter: So as I listen to you describe this, it is like a baby shark tank. Phil: Yeah, that’s well said. Yeah, exactly. Peter: Let’s get you focused, let’s get all of that you need to really think about with this business idea, let’s polish it and refine it, and then we’ll take it to the sharks and see if we can get some investors. Phil: Yeah, that’s a great way to sum it up. It’s baby shark tank, or pre shark tank if you will. Yep. So that’s the MVP. I know Jim Canterucci talks about the lean canvas: sort of a one-page business plan, if you will, and we allow them to utilize that as well. It forces the entrepreneur to look at their business from a macro level, but then it forces them to do their business at a micro level. I think that is sort of the nice mix right there. So you look at it from a big picture point of view so it doesn’t confuse you, you make the complex simple, but then when you really want to move forward you have to choose what small wins or small steps that you’re going to take and then just kill those. And just a series of small wins, one right after another, that how you get success. Peter: Yeah, and it takes me back and I use this in some of my presentations – and I know you’re very familiar with this – when like adult learners come back and want to get into a master’s program and that first class they’re all so excited, they’re all like I’m gonna get my master’s degree, and about halfway through it you lose a lot of students. 18 months is taking forever! Phil: I love it. I love that. Absolutely. Peter: It keeps the momentum going. And if you set those small goals, and when you achieve it, you can celebrate and there’s a little bit of excitement there. Phil: Absolutely, absolutely. It’s just like those checklists we talked about earlier. So glad you said that because I teach MBA classes as well, and there was a student of mine who had taken a 20-year break. Phil: A 20 year break, and I’m not even saying 20 year break from undergrad to grad. It was graduate school. She took her first class 20 years ago and then life happened. So she had to take a break and had to focus on raising her family, and 20 years later she comes back. Obviously, none of those courses transferred over, but she was just pointing out that this was a goal of mine and I realized exactly what you said. She had all of her classes charted out on this calendar and said I can only do one class at a time, one class a semester, so it’s gonna take me at least two-and-a-half years to get through this. But now I’m on my fourth class and I see some progress. So it’s nice to chunk it down into small steps, but to your point it’s also really encouraging to kind of get a small step and and look back and say “hey, I did it.” It’s like being on day 4 of a diet. Phil: I mean. day one, everybody’s excited. Day two, ninety percent of us have given up. But day four it’s like, okay, I got three days behind me. I think I can do this. Let’s get to day five. So yeah I think we definitely need to to celebrate the small wins, and in fact that’s one of… I actually have another TEDTalk. You said this will be March, but my first TEDTalk was in December. My second TEDTalk will be on February 18th, and it’ll be on YouTube as well. But the TED talk there is entitled “Reboot: Everyone Deserves a Second Chance,” and that really speaks to this idea of resilience and how people bounce back from failure. One of the key characteristics of people who are able to do that is this idea of persistence. Stick-to-itiveness. You know, having some grit. In light of failure, how do you respond? So what you said was perfect: these students that have taken a long time off need to take the small wins, but it really takes a lot of grit and determination to stick through it while your other friends are out partying and having their fun and your home studying. And it’s this idea of delaying instant gratification for the long-term benefit, and that’s what often separates people who are able to bounce back from failure. Peter: I will let you know that I will put a link in the show notes to the TEDxAlbany Youtube, as well as this recent one that’s coming. I’ll have both links in the show notes so you can go to it on my website under this podcast and be able to click it and watch it. I will say to everybody in this audience that it’s worth 17 minutes, and you said this next one coming up is gonna be a little bit shorter? Phil: Yeah, about eight to nine minutes. Peter: Not seeing the second talk, just based off the first talk and what I know: it’s well worth the half an hour watch both of them because, as you’ve heard through this interview, there’s a lot of great stuff. To go back and relive it, obviously you can relive it through the listening to this podcast over and over and over and over and over again and over some more. Peter: Or you can go out and on youtube and find Phil. Where’s your book being sold at? Peter: It’s well worth taking the time. Phil, before we wrap up, I want you to tell the audience, at the end of your TED talk, the Korean lesson. Phil: Ahh, yes, thank you. So, again, I don’t want to paint the audience with a broad brush but, for those of you who aren’t Korean, this may be your first Korean lesson and I’m gonna force you do with me, Pete. Repeat after me: Shijaki banida. Phil Ah, beautiful. Man, better than me. Okay, so basically that translates to Shijaki, which means the start, and banida, which means half. That literally translates to the start is half the task. So again, what I often say is I want you to think big, I want you to start small, but whatever you do I want you to start. So many of us have these great ideas that basically we think in our heads and that’s where dies, or we even write it down and that’s where dies, but in order for us to move forward in our businesses in our lives, to get stuff done, to pick ourselves back up, we have to think big and we have to start small, but the start is half the task. So I want people to start. Whatever it is, even if it’s a bad idea, you won’t know unless you start. So the start is half the task. Peter: And as I always say, bad ideas are just bridges to good ideas; no ideas lead to absolutely nothing. Peter: That’s straight out of improv. So Phil, thank you so very much for taking time. This was a great conversation you dropped so many nuggets for this audience to act on, and I look forward to a future conversation in a future venue. So thank you once again my friend. Peter: I would like to thank feel again for taking time out of his schedule to give us ideas about how we can chase only one rabbit at a time and gain greater focus. In episode 41, I interview John Kelly, who is the chief people officer at one of my favorite companies: White Castle Systems. Our discussion focuses on the topic of change management, and how this has evolved over the history of this family-owned business. White Castle was founded on September 13th, 1921, and they will be 100 years old in only four years. Thank you again for listening, and remember to use Yes, And along with your focus to help achieve your goals on one rabbit at a time. Are We Clear? Roger, Roger.